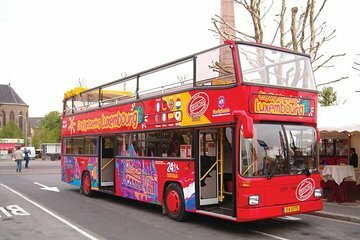 Explore Luxemburgo a su propio ritmo en esta excursión en autobús con paradas libres. Disfrute de viajar de forma ilimitada durante 24 horas y disfrute de las vistas panorámicas a lo largo del trayecto con comentarios a bordo. Permanezca a bordo durante todo el trayecto de 1 hora o baje para explorar a pie. Descubra las principales atracciones de la ciudad, como Gëlle Fra, Place Guillaume II, el Bock, el Fuerte Thüngen y el Museo Nacional de Historia y Arte. Dé un paseo por las bulliciosas calles, como la Rue du Fossé y la Rue du Kiem y saque el máximo provecho de los restaurantes y tiendas de la ciudad. Pase válido por 24 horas. We signed up and paid, but the tour wasn’t operating on a Sunday. A nice route through a unique but compact area with a lot of geographical attractions and new very modern and old urban landscapes. If you've only got a short time in the area as I did, definitely try it! Small city - limited stops. Main attractions close to each other. Can consider public transport walking as well. This tour was okay as a glorified bus drive through the city. If i wasn't suffering from an illness that made sitting difficult I probably would not complain but... The driver drove like a race car driver, since it was not a busy day the driver would just blow by the stops and you could not take good pictures. Good thing my wife was happy and enjoyed herself, otherwise I would have given this tour a 1 out of 5. Excellent. Used for tour and to visit locations of our choice. Very convenient. Great introduction to the city. If arriving via rail, exit the train station and walk to your right, passing the bus stalls to find the pick up point, by the sidewalk outside the building... about 5 meters from the busy street. I suggest you ride around once to figure out where you might want to get off later, but exploring the park and casements just below the Constitution Square main start point is a great option. Multiple language options and free head phone round out a nice way to learn about a fascinating city.